Like just about everyone else this time of year, I’ve promised myself that I am going to get back to some healthy habits when it comes to food and cooking. The last quarter of 2010 ended up being exceedingly stressful for me, which led to a lot of poor food choices and a total neglect of the elliptical machine. And then, of course, there were the winter holidays, and I have never been capable of refusing that extra slice of baked ham or scoop of mashed potatoes or plate of cookies at Thanksgiving and Christmas. The holidays only come once a year and I allow myself to enjoy all the flavors and treats of the season with joyful abandon. Unfortunately, that means I have to do some serious penance after New Years to offset my earlier excesses. Luckily, I happen to enjoy the challenge of making food that is low fat/low cal, highly nutritious, AND delicious. In particular, I like to take foods that are classically rich and heavy and find ways to make them light and (at least somewhat) virtuous without eliminating the comfort food factor, particularly during this time of year when walking outside is like walking into a deep freeze. Hearty, warming fare is absolutely called for right now, but that doesn’t mean I have to pile a day’s worth of calories onto my plate. Tuna casserole is one of those soul-warming, utterly American comfort foods that most of us probably grew up eating. 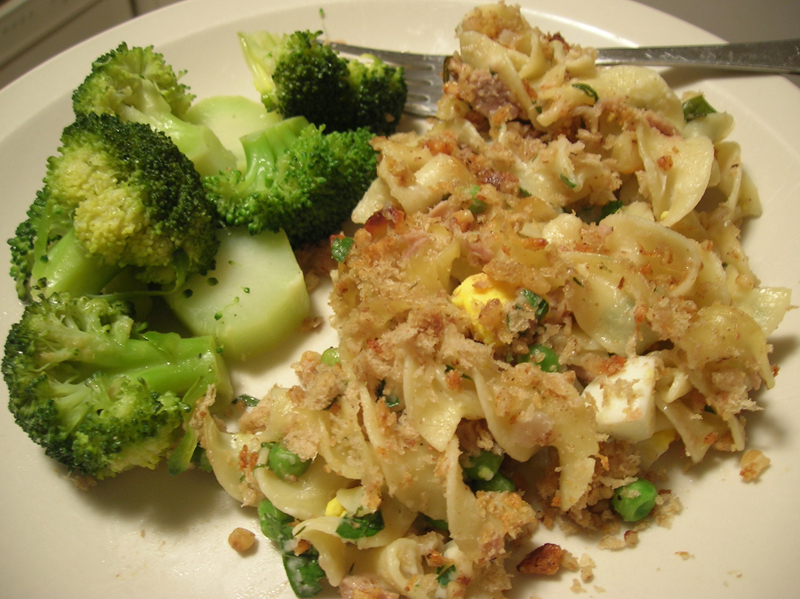 The tuna casserole I remember was made with mushy canned tuna, some sort of condensed cream soup (Campbells Cream of Mushroom was probably the culprit), egg noodles or macaroni, and crushed up saltines on top. I’m pretty sure I hated it. And though I eventually learned how to make a REAL tuna casserole from scratch, with fresh bechamel sauce, vegetables, herbs, and good cheese, its still a calorie bomb and not something I’m willing to make on a regular basis. This version, though, is light enoguh to be made as often as I crave it, which is likely to be often since I honestly think it tastes better than my traditional, full-fat version. I am convinced that even with the Greek yogurt, what makes the finished casserole seem so delightfully rich and creamy is the hard-boiled eggs that get layered into the middle. I’m a little picky about hard-boiled eggs, myself, but in this dish they don’t seem to add as much flavor as they do texture. The key is really to cook the eggs properly – you want the yolks to be just set and not dry or grainy, and the whites to still be soft and lightly bouncy. That allows them to almost melt in with the noodles and tuna and create an incredibly decadent mouthfeel, despite the relatively small amount of sauce. The combination of bread and nuts in the crumb topping provides the perfect textural contrast to all the soft, creamy stuff underneath, and adds the most deliciously toasty, nutty flavor to offset the bright flavors in the casserole. This is a trick I just might use on all my casseroles and baked pasta dishes from now on. Tuna in a pouch is quite possibly one of the best food packaging innovations of the last decade. The fish has better texture and taste, and its packaged without all the extra liquid and preservatives you’ll find in the canned stuff. The tuna I buy now has only tuna, salt, and vegetable broth listed in the ingredients, which is great because Justin can actually eat it. (He has an allergy to sulfites, which are common preservatives in canned tuna and lots of other things.) This is one of those times when paying a little extra for a superior product is really worth it. You could certainly eat this on its own and call it dinner, but a simple green vegetable side dish really rounds out the meal. We had some steamed broccoli tossed with a basic lemon vinaigrette, but some garlicky sauteed greens like spinach, chard or kale would also work well. Preheat the oven to 400 degrees. Spray a 9″x13″ baking dish with cooking spray or grease lightly with vegetable oil. Melt the butter in a small skillet over medium heat, then add the onions, garlic, and bay leaves and sautee until onions and garlic are softened and just beginning to brown. Add the skim milk and bouillion, then reduce heat to low and simmer for about 10 minutes, stirring regularly, until milk is slightly reduced and the mixture is fragrant. Remove from heat and allow to cool slightly, then remove bay leaves and discard. Stir in the Greek yogurt and fresh herbs, then add salt and pepper to taste. Set aside. Use a food processor to finely chop the walnuts, then pour into a large bowl. Tear the rye bread into small pieces and place in the food processor, then pulse repeatedly to create coarse and slightly regular bread crumbs. Pour into the bowl with the chopped walnuts and toss together. Set aside. Cook the egg noodles according to package directions, subtracting about a minute from the cooking time so that the noodles are slightly underdone. Drain and rinse in cool water, then place in a large bowl. Stir in all but a tablespoon or two of the sauce, as well as the peas. 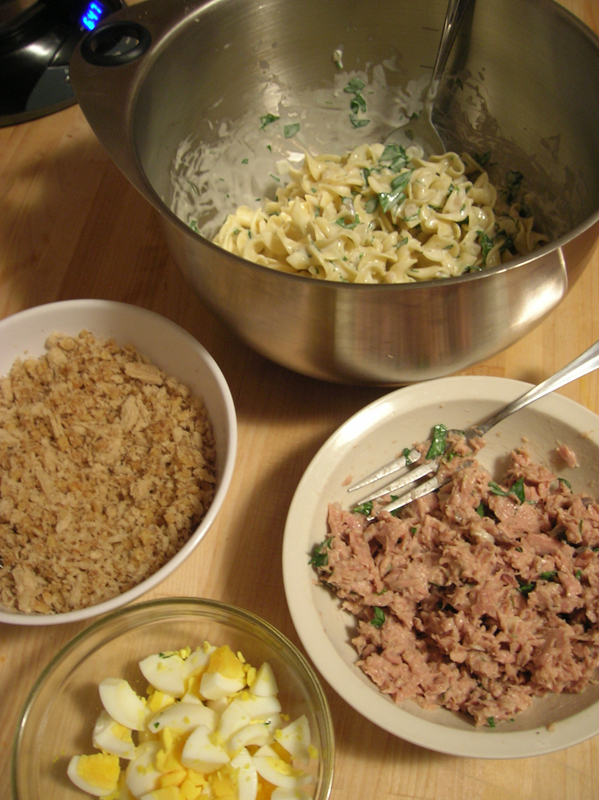 Place the drained tuna in a smaller bowl and mix with the remaining sauce. Cut the eggs into quarters lengthwise, then cut the quarters into small pieces, keeping the yolks and whites together as much as possible. To assemble, pour half of the noodle mixture in the prepared pan and spread evenly. 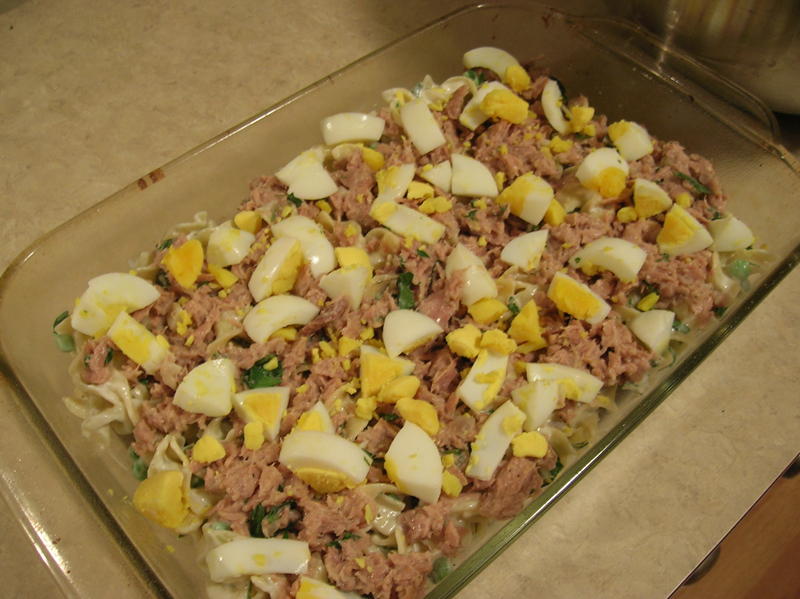 Spread the tuna mixture evenly over the noodles, followed by the chopped egg and the remaining noodles. 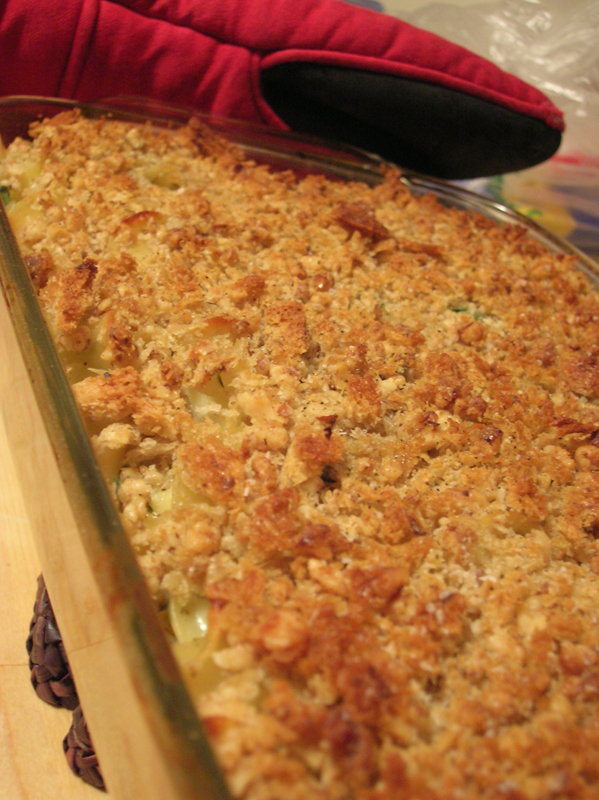 Spread the bread crumb topping evenly over the top of the noodles in a relatively thick layer. (You may have extra topping – save it. It’d be delicious toasted in a pan and tossed with hot buttered pasta as a super simple dinner for one.) Drizzle the melted butter over the topping, then sprinkle the whole thing with a bit more salt and freshly cracked black pepper. Bake for 20-25 minutes, or until the casserole is slightly bubbly and the topping is nicely browned and crispy. Allow to cool slightly before serving. This entry was posted in Food, Drinks and Cooking and tagged casseroles, cheese/dairy, dinners, eggs, fish, noodles, pasta/grains, seafood, vegetables. Bookmark the permalink. Hi! I made this tonight with a few minor changes…it turned out really good! I’ve never had the canned soup version and that really doesn’t sound very appetizing! My boys loved it too and my eldest is taking leftoveres for lunch! Thanks for sharing!